Earlier this year, Piotr Delgado “The Mexican Runner” Kusielczuk completed his quest to beat every NES game ever made. Today, he made history by beating one of its most difficult, Battletoads, and setting a new world record in the process. Shaving just two seconds off the previous record, Kusielczuk managed to finish the game earlier today with a time of 12:45. The speedrunner began drilling down on the game over the past month, practicing regularly with his eyes on first place, and just a week ago, he managed to tie Tionic’s time of 12:47, a first-place record that had previous stood for nearly a year. Today, a nearly flawless run allowed him to claim the title as his and his alone. Long considered one of the most difficult games ever made, Battletoad’s legacy as an unrelenting arcade gauntlet of player death and frustration has softened in recent years as newer indie throw-backs have picked up the mantel of masochistic gaming. But speedrunning the game is difficult not simply because of the game’s jenky animations and hitboxes, but also because of how much time has been invested in perfecting playtroughs of the game and the intense competition surrounding that endeavor. 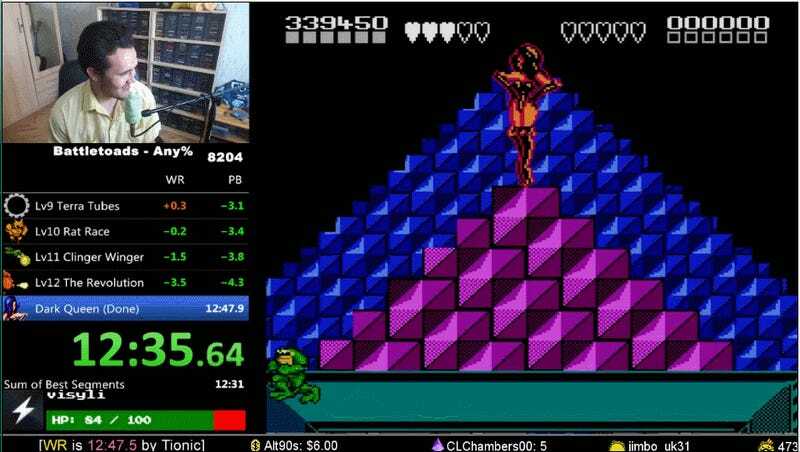 Kuzielczuk and Tionic have been dueling for every Battletoads speedrunning record for a while now, and like trench warfare, the gains are incremental and few (the latter still has him beat on Warpless runs by six seconds). In another version of the video, you can hear Kuzielczuk do commentary on his run, with particular attention paid to missed jumps and all the ice blocks he got trolled by. In effect, he still has improvements he can make to keep pushing the record forward. Meanwhile, for more speedrunning genius, you can check out Summer Games Done Quick, a week-long marathon going on right now.